New York has its High Line. Seoul has Cheonggyecheon 청계천 清渓川, a glorious urban river in the heart of the city. What does Tokyo have? A lot, it turns out. There are countless miles of pedestrian paths and “green roads” that follow the route of old rivers and streams. They may not be well-publicized, but they are EVERYWHERE, as I would find out. 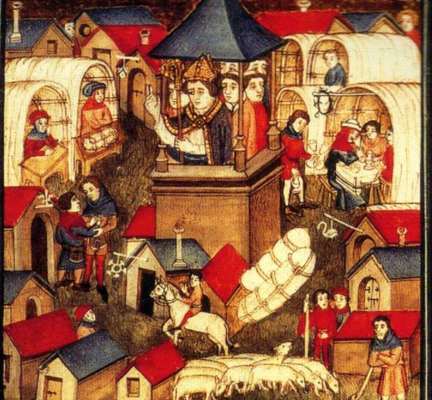 This post is in part a history, in part a travel guide, and completely an obsession of mine. I’m not alone…a recently published book is titled 『 暗渠マニアック！』 (Ankyo Maniac), or “Culvert Maniac!”. And I’ve recently been following a growing number of culvert fanatics on Twitter. It started with an observation: a street with a raised path running down the center of the road. The path was landscaped like a park, with trees, paving stones, and the occasional bench. Raised walking path of the former Tachiaigawa river, now a green road in Meguro-ku, Tokyo. 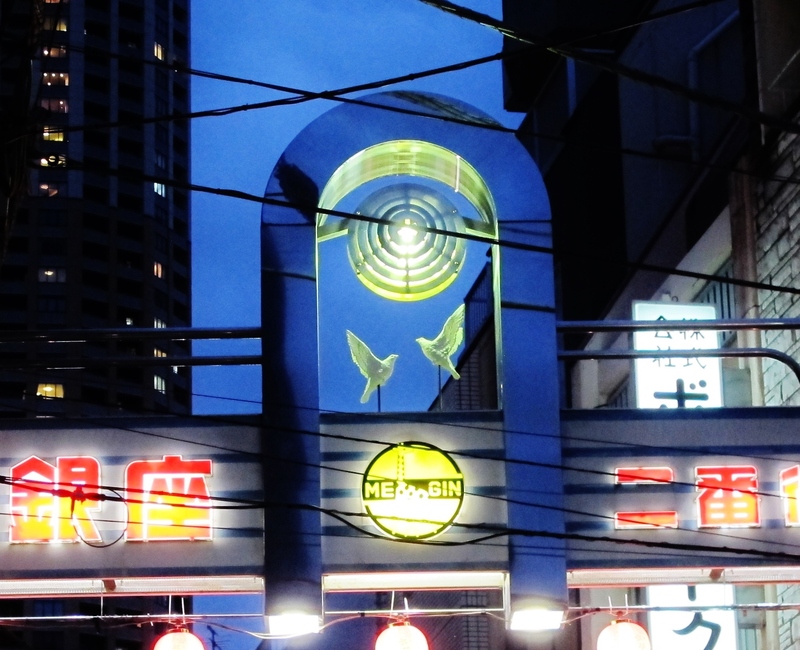 The example I first mentioned is now called Tachiaigawa green road 立会川緑道 in Meguro-ku (map), and runs from Himonya Hachiman-gu 碑文谷八幡宮 shrine in the west to Yukimi-bashi in the east, then turns sharply to the southeast, crossing the old “Meguro Kamata Electric Railroad”. 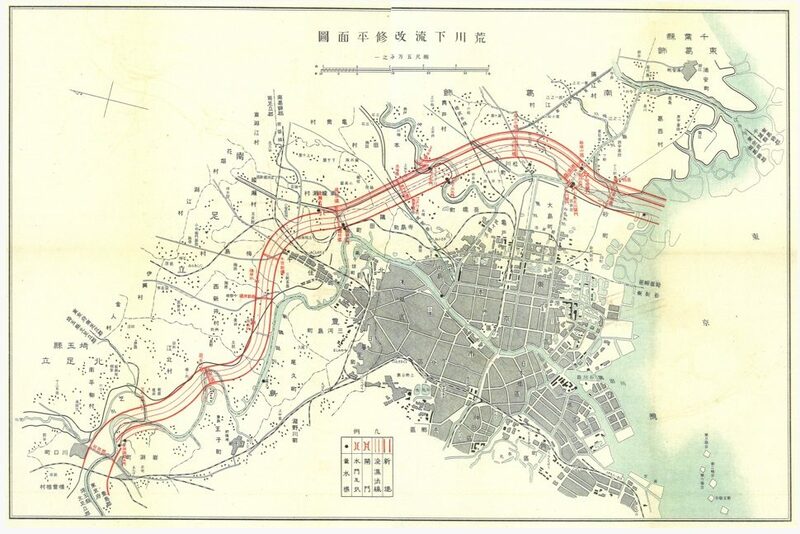 Seen in a 1948 map, this used to be the Tachiaigawa river 立会川 ; the current river exists only briefly, emerging from underground a few hundred meters inland from Tokyo Bay. …but I’ve come to discover that these old maps were quite accurate, and may even have understated the amount of moving water in Tokyo/Edo. I found this out firsthand when attempting to map ALL of the underground rivers and streams in Tokyo. There are many types of moving water in Tokyo. There are the mega-rivers: the Tamagawa, Sumida, Arakawa, and Edogawa. And there are over 100 small and mid-sized rivers and canals such as the Kanda, Meguro, and Zenpukujigawa rivers, all part of a larger river system; the Tamagawa and Arakawa river systems are each responsible for about 40 tributaries 支流. In addition, there are unnamed streams and irrigation channels, followed by countless drainage ditches and culverts. Tokyo’s system of rivers and streams owes as much to man as it does to nature: many of the water that reaches the city’s center is the result canals and aqueducts that were built centuries ago. The development of this system is explained at the satisfying Tokyo Waterworks Historical Museum 東京都水道歴史館 (below left). The map, below right, provides a nice overview of these systems (source). This type of former river is easy to spot, and often the most beautiful. Kuhonbutsu River Green Road 九品仏川緑道 in Jiyugaoka is a classic examples. In this map, the river’s route is easily visible. The red X at the right is the former river’s outlet. 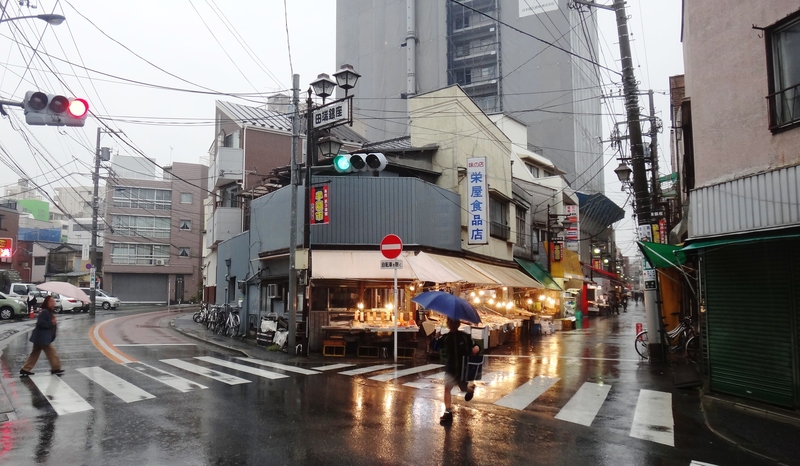 And here’s a view of Jiyugaoka’s green road from the ground. This is the type of pattern that became more obvious to me the more I stared at the maps…grey lines that subtly make themselves known due to the absence of houses or other features. Take these two maps from Chitose-Karasuyama station (map). Do you see the hidden rivers and streams? 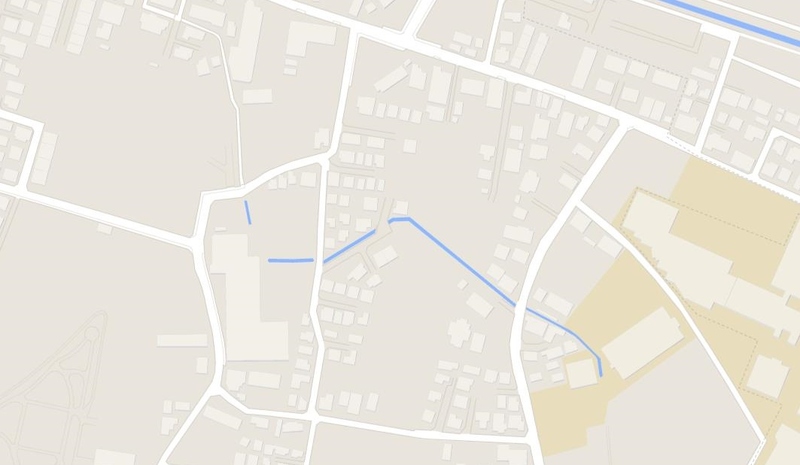 Many of the very narrow roads on Google Maps are actually former streams or drainage ditches. Some of these appear as streams on the 1945 map. Others, such as the example below, do not appear on the 1945 map, but I validated they were former streams based on other sources. Seen below left, the Yatomaegawa Green Road 谷戸前川緑道 is a thin road running horizontally across the map; it’s not obvious from this view that this isn’t simply a narrow road. However, as seen from StreetView, below right, this is obviously a pedestrian path. Although most items that I mapped are HIDDEN rivers and streams, I have also included bodies of moving water that were dramatically altered, often into the form of parks. These are mostly in Koto-ku or Edogawa and were former canals/rivers that cut through the city for trade, navigation, etc. Although some water is still visible, these streams no longer perform their original function and are now used for recreation. 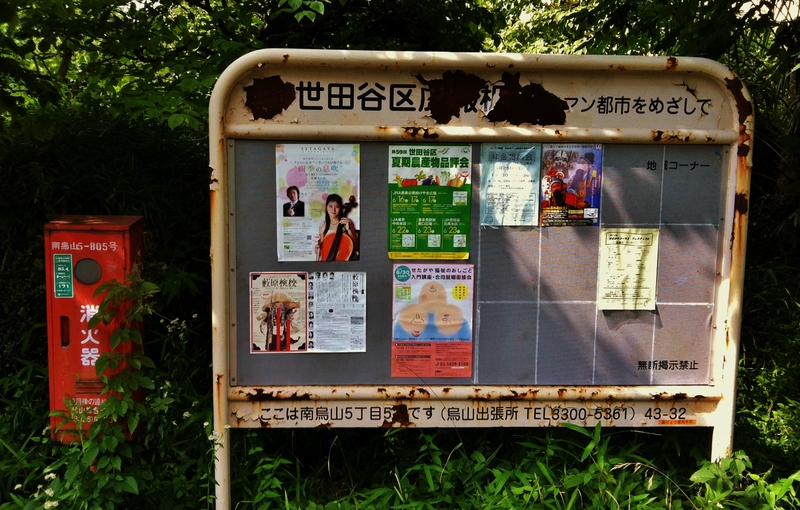 Below, for example, is Furukawa Water Park 古川親水公園 in Edogawa (map). These patterns describe most of the former rivers. Additionally, I have mapped some of the major reclaimed land areas, and in a few instances, have mapped walking paths that are the result of defunct streetcar lines. The map is certainly a work in progress, and I am somewhat less committed to mapping Koto-ku and Edogawa, as those wards consist largely of reclaimed and drained land; as a result, rivers, canals, and drainage ditches can be found under virtually every road. 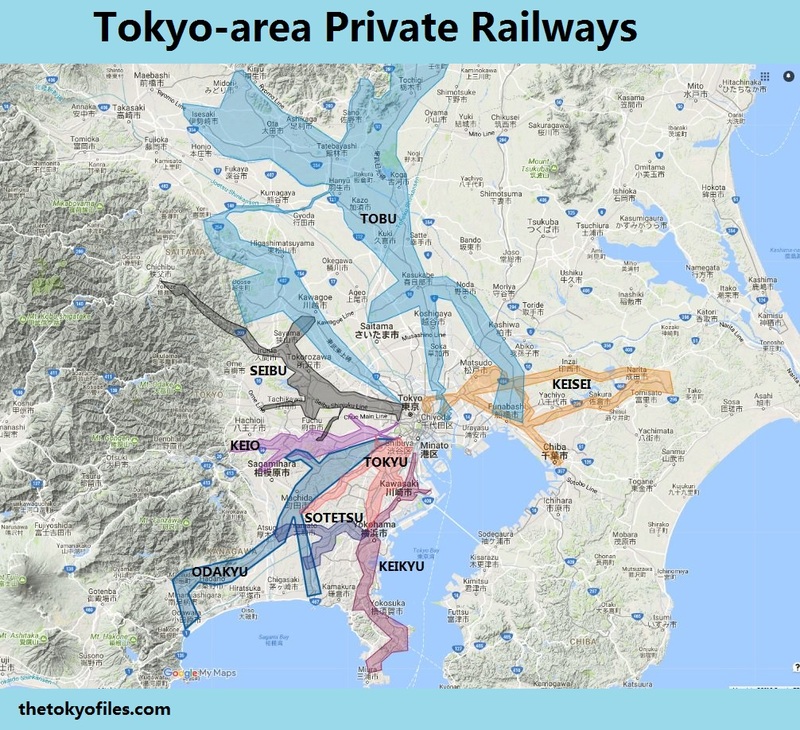 The map above, and list below, is a work-in-progress collection of various underground rivers, hidden streams, green roads, and major land reclamation projects in Tokyo. See also the Japanese website, River Promenade 川のプロムナード, which is an excellent resource. (700) 野火止用水（のびどめようすい、のびとめようすい）Nobidome water (Nobidome-yosui canal, Nobitome-yosui canal), aka 伊豆殿堀（いずどのぼり） (Izudonobori) – Most of this water is visible / a special section of this canal is (700A) 本多緑道 Honda Ryokudo (Honda Pedestrian Path), which is nestled in a thick forest. 緑道 (ryokudo, though I’ve also seen “midorimichi”) = green road / pedestrian path / green way / pedestrian mall – this term is applied to a sidewalk or paved path that runs along trees, grass, a stream, etc. Green roads are often built on the site of an old canal, river , or defunct railway line. Green roads are used both for pleasure, like a park, and also just for pedestrian access from A to B, depending on where they are built. In my personal usage, a “pedestrian path” refers to all paths that are different from a standard sidewalk (sidewalk, meaning, a raised pedestrian walking surface that borders a road). “Green road” is used for a pedestrian path that has greening elements like trees, a stream, etc. 遊歩道 (Yūhodō / Yohodo) = promenade / esplanade = a green road may also be described as a “promenade” if it is shorter in length, especially if the promenade is located in an urban center, where the path is intended for strolling and park-like activities. rainwater collects into the “grooves” 「どぶ」 (dobu). 上水 (jōsui, josui) = water supply, canal, aqueduct, waterworks, clean water – when used to describe a specific waterworks project, such as the Tamagawa Jōsui 玉川上水, the word 上水 jōsui is probably best translated as canal or aqueduct. For clarity, I desribe such a project as the “Tamagawa josui canal” or “Tamagawa josui aqueduct”. That work, specifically, is a 43 km canal that diverts the Tamagawa River to central Tokyo. It is no longer used for drinking water but much of the canal remains. Kandagawa is actually Kandajosui 神田上水, a canal system (source).